A strategically-located business centre, in the heart of Santiago. This building has secure parking for tenants and excellent communications infrastructure. It is conveniently located, with good public transport links, and is near the city's new financial and administrative area. 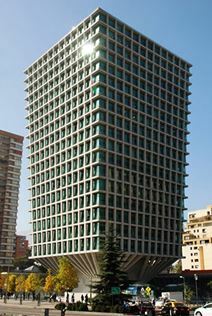 Situated in the heart of the tranquil and locally significant area of Providencia, this comfortable tech-powered office space is located within a modern and exquisitely furnished business building which provides a diverse and extensive range of exceptional corporate and impressive accommodation for many types and sizes of professional occupancy requirement, ranging from between one person and groups of up to 11 people. With a fantastic central location close to the subway station and a large number of the region's foremost and exceptional quality local amenities, this Class A and industrial award-winning business building installation provides exquisite and highly modern office space solution packages with floor-to-ceiling windows that offer tenants beautiful views and an abundance of natural light to its interior workspaces and communal areas. 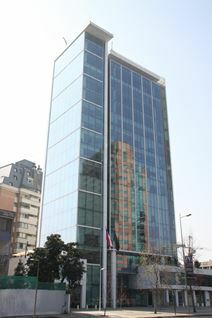 Office space to let in a modern tower located in one of Santiago's newly-developed commercial districts. The building features CCTV security and secure underground parking. The centre has good access to main roads and is walking distance to a metro station. This centre boasts a strategic position on the corner of Apoquindo and Américo Vespucio. The building has won many architectural prizes, and offers leading-edge technologies and comfortable office space. Impressive materials and infrastructure are sure to impress your clients and help your business flourish. This business center is recognisable for its striking architecture. The center is a new Class A building also has stores, housing and a famous hotel. It is popular internationally as well as with local businesses. Its location in Las Condes means the center is close to the city's high quality retail and dining facilities. There are more than 2,000 members among all the offices, and more than 500 companies, this site is a global network of professionals that at some point can become your customers, suppliers or even your partners. A strategically located business center, featuring 24-hour secure access, a business lounge, underground parking and meeting facilities. The center is located in the El Bosque Business and Residential District of Santiago. It has convenient public transport access, including a metro station within walking distance and is adjacent to the World Trade Center. Nearby are banks, shops and excellent restaurants. 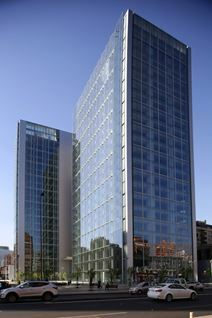 Offices to let in a modern office tower in Santiago. The building has an internet café, and a lounge area. 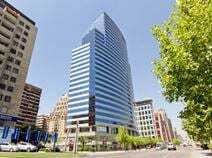 The building is set in Santiago's premier business district -Las Condes, and is a stone's throw away from 5-star hotels and the US Embassy, as well as amenities such as banks, the metro and fine dining. 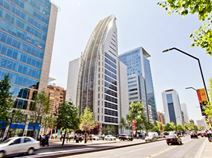 With on-site staff that can speak Spanish, English and Portuguese to support your business these all-inclusive serviced offices are located on the 17th floor of a brand new AA Class building in the heart of Santiago. The building is already home to a number of insurance, electronics and mining companies while tenants have access to two, high standard meeting rooms. The locality also offers excellent transport links that make the center easily accessible. 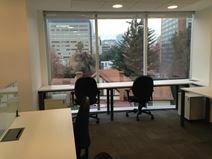 Offices for let in a newly-completed building in Santiago's Las Condes business district. This building adjoins the city's best (and largest) shopping mall - Parque Arauco Mall. This puts the building in close proximity to a range of shopping, dining and entertainment facilities, including a medical centre, cinemas, bowling, and even an ice-skating rink. There are convenient bus and metro connections, but the centre is also within walking top international hotels, residential buildings, parks and a golf course. Set in a distinctive piece of architecture in a superb location in the shade of the Andes, this serviced office center provides a range of flexible office spaces to suit your needs. Ideally placed very close to several major road connections and a local metro station. The regional transport links present in the area are also excellent and provide all prospective tenants and visitors to the business center with a range of convenient services. In the vibrant neighbourhood of El Golf you will find this exciting, innovative centre. Home to an inspiring and creative work environment which is near to an abundance of comfortable hotels, trendy boutiques, shopping districts, a plethora of restaurants, cafes and bars, and local art galleries. Regardless of what type of work you do, this area has everything to keep you amused and your guests entertained. In approximately 15 minutes drive you can find yourself in central Santiago with even more cultural, leisure and retail facilities to access and Santiago Airport is under 30 minutes away to meet all your travel needs. Conveniently located in one of the most popular and dynamic areas of Santiago, this building consists of office spaces elegantly furnished and decorated with great attention to details to offer you a highly professional working environment. They are provided with parking facilities, high-speed elevators, 24 hours security and a full range of other facilities and services. The building is surrounded by other companies, shops, restaurants, cafes and benefits from excellent public transport connections. This exceptionally well equipped and fully functional business center installation is situated within one of Santiago's most prestigious and commercially significant corporate districts, with an abundance of professional services and successful business residents present throughout the immediate locality. The local transport links are also excellent and provide a range of convenient and frequent services in operation. This exquisitely furnished and state of the art business center offers cutting edge IT as well as a contemporary design. It is conveniently situated in one of Santiagos commercial hubs and thus enjoys access to transport links and lifestyle amenities. On-site facilities are plentiful, and include administrative support, conference facilities, secure parking, meeting rooms, IT support and an on-site management team. A wonderful centre situated in a prestigious area, providing a range of useful amenities including meeting rooms, high-speed internet, business lounge area and dedicated reception desk. In addition, this centre provides plenty of conferencing opportunities in dedicated meeting spaces. The area is filled with local amenities such as local restaurants, bars and hotels. Public transport links are numerous with easy metro links available at your doorstep. The international airport is also easily accessible within 25 minutes. This centre occupies an ideal location, close to many shops, restaurants and excellent transport links. This modern property offers a full range of efficient and comfortable serviced offices featuring the latest in business support services. 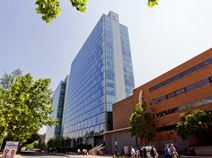 An elegantly appointed, modern building in Santiago's new business district - Nueva Las Condes. The building comes with bilingual reception and secretarial support, 24-hour security services, and quality, modern communications infrastructure. The building is strategically located, with good access to the city's highway network, and is near major international hotels and the best shopping centre in the city. This impressive and exceptionally professional 13-storey building is topped with a wonderful rooftop terrace that provides a panoramic view to Downtown Santiago. Inside there are 162 professionally equipped and fully serviced office suites with an average size of 23m² and eight meeting rooms designed to benefit from the abundance of natural light that they receive. The locality also benefits from the region's fantastic and convenient transport links.